Son of a shoemaker. He worked as a decorator and house-painter and studied art in the evenings. In 1820 he married an actress and they had a daughter, Christine. He worked for large theaters in Scotland and he and his more succesful rival Clarkson Stanfield would eventually become close friends. In 1822 he moved to London and after his marriage had failed he took care of Christine. Roberts exhibited at the Society of British Artists and became its president in 1831. In 1839 he became an associate of the Royal Academy and in 1841 a full member. He was famous for his sketchings of foreign lands (In 1850 his sketches of the Holy Land and Syria were published). Roberts was an early mentor to John Ruskin, who criticized his paintings of Venice in later years. Ruskin told Roberts that it was his duty as a critic to seperate this work from personal affection. 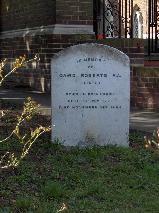 The grave of David Roberts at West Norwood Cemetery, London.